Pennsylvania's Revenue Secretary, Dan Meuser, explains in a letter to the editor that the state's increased revenue collections are the result of one-time payments and $260 million of the Commonwealth's current excess revenue will not be available next year. The Revenue Secretary explains that $260 million in one-time payments have helped increase revenue collections due to changes in Pennsylvania tax regulations. This one-time boost in revenue collections are a good sign that Pennsylvania businesses are doing better, but it also means that we must be careful not to base a 2011-2012 fiscal year budget on revenues that will not be available next year. Route 422 Tolling Survey – I would like your opinion of the Delaware Valley Regional Planning Commission (DVRPC) plan to place tolls on Route 422. Please visit my web site and give us your thoughts. Congratulations Mr. Secretary – I was proud to attend the swearing-in ceremony earlier today for Glenn E. Moyer, the former president and chief executive officer of National Penn Bancshares in Boyertown, who is now Pennsylvania’s new secretary of banking. 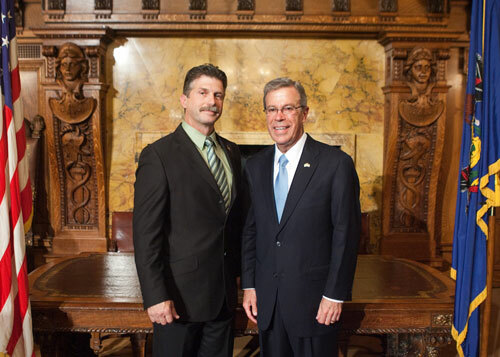 Secretary Moyer brings a wealth of knowledge to the position, and I know he will proudly represent Oley Township and all of Berks County in Harrisburg.